Can Alex Smith lead the 49ers to the Super Bowl? Let’s be honest, I don’t think many of us expected the San Francisco 49ers and the New York Giants to be facing each other in the NFC Championship game. The Niners shocked the nation this past weekend, defeating the New Orleans Saints with their own replica of “the catch” 36-32. This will be San Francisco’s first time appearing in the NFC title game since losing to the Green Bay Packers in 1998. 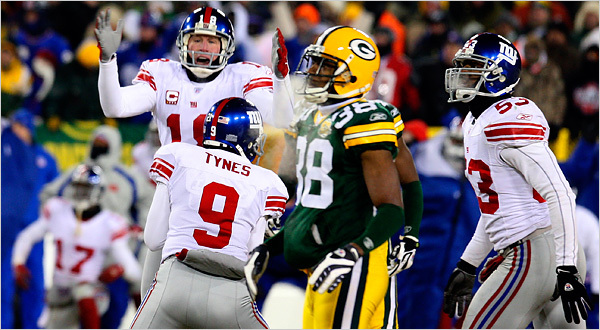 New York also surprised us by dismantling the defending Super Bowl Champion Packers at Lambeau Field 37-20. This will be the Giants’ second appearance in the NFC title game in the last four years. Both of these teams met in week 10 of the regular season, in which the 49ers won 27-20, but things will be much different this time. The G-Men enter this game full of confidence and have a good reason to. Their defense has been on a tear, shutting out the Falcons’ offense in the Wild Card and holding the Packers’ offense to 20 points in the Divisional Round. The defensive line has been superb as New York can relentlessly rush the passer without having to bring extra defenders. Eli Manning has also silenced his critics after a helluva display in Green Bay. He is finally looking like the elite quarterback he claimed to be prior to the start of the season. It also helps with the big play receivers he has around him. With all the attention going to Victor Cruz, Hakeem Nicks has already gotten four touchdown receptions in the playoffs. Although the Giants are red-hot, don’t expect the Niners to back down by no means. San Francisco, in my opinion, are the best tacklers in the NFL, which why their defensive is so good. Their defensive backs don’t freeze up like a deer in the headlights and can make the play. They can also pressure the quarterback and stuff the run. Many saw Alex Smith as the biggest question mark heading into the playoffs, but after last week’s heroics, I think he’s answered bell. For the first time, I saw Alex Smith play like the number 1 pick that he is. He made all the right throws, exploiting New Orleans’ man-coverage. Even though Alex proved to us that he can sling the football, I don’t expect the Niners to change their game plan. They will go into this game seeking to pound the ground game and play solid defense. San Francisco leads the NFL in takeaways, therefore they will be looking to capitalize on the opposing team’s mistakes. The Niners are one of the league’s best in protecting the football and don’t beat themselves too often. The Giants will need to focus on stopping the run and force Alex Smith to beat you. Yeah, Smith had a great outing last week, but let’s see if he can do that again. The secondary will need to have their focus on tight end Vernon Davis after his stellar performance last week. As much as I dislike the Giants, I see them going into Candlestick Park and prevailing with a win. The Niners may have a great defense, but I don’t see them stopping Eli Manning and the Giants. The Niners showed last week that you can throw the ball on them and score points. Eli is looking better than his brother Peyton right now and he will outplay Alex Smith. Smith has had a great season thus far, but he will be exploited on Sunday. Smith has never been a great passer under heavy pressure. The Giants won’t be afraid to test him. The 49ers’ defense will keep it close, but Eli and Co. will pull it out at the end. Can the New York Giants leave Lambeau Field with a win like in '08? The surging New York Giants are heading into the Divisional Round full of confidence after manhandling the Atlanta Falcons in the Wild Card. This New York team possesses a lot of similarities from their 2007 Super Bowl team, which is scary. They are set to face a huge test visiting the reigning Super Bowl champion Green Bay Packers. Lambeau Field hasn’t hosted a playoff game since the ’07-‘08 NFC Championship game when the Giants came into Green Bay and ended Brett Favre’s Packer career. Ironically, the G-Men find their way back to Wisconsin. It took nearly all season, but the Giants are finally clicking and are looking dangerous. The defensive line is top-notch. The past couple of games, New York has been able to constantly harass the quarterback. Offensively, Eli Manning has been carrying this team all season and has now become an elite quarterback. They have a lot of explosive weapons with Hakeem Nicks, Victoz Cruz, and Mario Manningham. Even the running game has been coming alive as of late. In week 13, the Giants’ skill players have already proved that they can go head-to-head with Green Bays’. Expect New York to make some explosive plays down the field. The Packers head into this game led by their All-Pro quarterback Aaron Rodgers. This guy is doing things you do in video games. Rodgers has excellent mobility and makes everything looks so easy. He is also expected to win the NFL MVP (which he should). The biggest question, however, is the Packer defense. They give up a ton of point and yards, but they lead the league in takeaways per game. The Packer defense still has enough talent to make game changing plays and if you give Rodgers extra possessions, he will make you pay. I feel like the Green Bay Packers are heading into this game kind of under-the-radar. They may have won 15 games, but most of the coverage I’ve seen I think we all kind of forgot how good they are. The Packers are going to come out with something to prove and shut the Giants up. Aaron Rodgers is going to take complete control and will eventually overwhelm New York. Here is my list of players on the offensive side of the ball I feel were left off the Pro Bowl rosters unjustly. Aaron Rodgers (NFC) – 27 TDs, 10 INTs. When was the last time that wasn’t good enough? Matt Cassel (AFC) – Led the Chiefs to their first playoff appearance since 2006 with solid numbers. 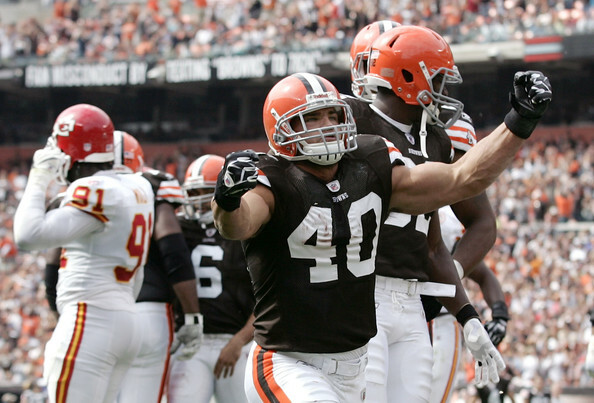 Peyton Hillis (AFC) – Probably the biggest snub of the bunch. Sure he had his fumbling problems, but boy did he carry the load for the Browns. Look for him to make the Pro Bowl in the coming years. Hakeem Nicks (NFC) – Shocker of the NFC in my opinion. Dude was a monster before the injury bug bit him at the end of the season. 11 TDs and over 1000 yds receiving is enough for a vote in my book. Mike Wallace (AFC) – Led the AFC in yards per catch and went over 1000 yds receiving. He will get his chance sooner rather then later. Vernon Davis (NFC) – The 9ers were garbage this year, but it wasn’t his fault. Solid year for Mr. Davis and will attend many Pro Bowls in the future. I think he’ll live. Rob Gronkowski (AFC) – “The Gronk” had a break out season this year despite fighting for targets with New England’s other stud tight end Aaron Hernandez. Gronkowski has 9 TDs to date and will instead enjoy a trip to the playoffs rather than an early vacation. Can Fitz still be a viable fantasy option with Leinart taking over for the retired Warner?